Globus is a hand-made, luxuriously furnished bus made for special occasions and for organising small conferences and various entertainment events – great for having a party and convenient for taking care of business as well as for relaxing trips. Globus is like a mobile nano club with its video technology enabling to view media material on 12 different indoor and outdoor screens – directly from the internet with the help of 4G Wi-Fi or from various storage devices. Globus is also equipped with a powerful (6kw) audio system, the quality and power of which matches the best clubs. There are also dance floors, various show instruments, couches, a toilet and a bar with a chaperone in the bus. Further, a covered outdoor café can be used. 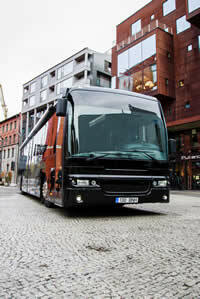 The bus seats 49 passengers, but it is comfortably spacious for a company of up to 35 people.